Remember my Sears bike was branded as a Sears and it was a 3 speed. That was the bike I Evel-Knievel’d the neighborhood kids and after a parent meeting, it was agreed that I’d not jump them anymore. I just barely hit the 5th one that wiggled too much away from the 4th. They were stacked lined up away from a ramp I made from plywood and a garbage can. 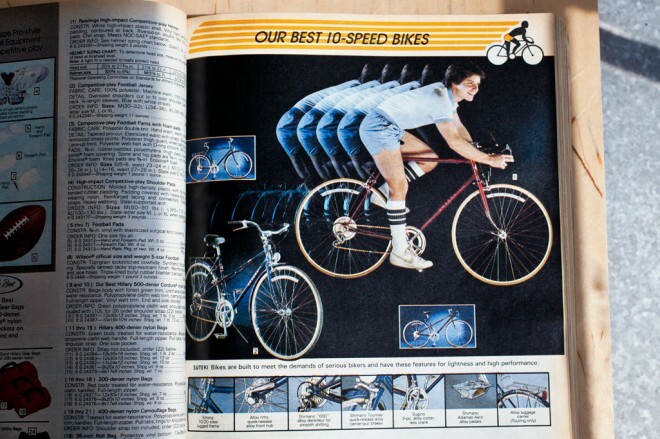 Those Sears bikes are still around (think mine was garage saled), like old Raleighs. I spotted one in a waterfront park in 07 and another in 09. Previous Previous post: Bike Hugger Magazine Subscribers!